Around this time of year, everyone seems to be coming down with a cold. Even my little guy caught his first cold last week, which was not fun for any of us (especially with a sick hubby, too). And what’s the first thing people always seem to tell you to eat when you’re sick? A good ol’ bowl of chicken soup. Penned as “Jewish Penicillin”, there’s something super comforting about it when you’re under the weather. But, who has time to whip up a pot of chicken soup from scratch? 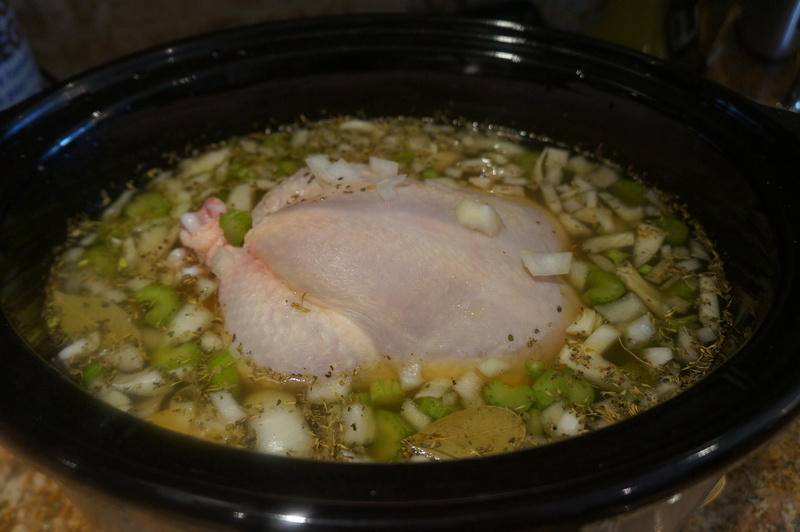 That’s why I was really happy to find this slow cooker recipe for a traditional chicken noodle soup. Throw all the ingredients together in the morning and come home to a freshly made, hot soup. Even works for the man-cold. I should know. In 4-1/2 to 6-quart slow-cooker bowl, combine water, carrots, celery, onion, garlic, bay leaves, thyme, 4 t salt, 1/2 t pepper. Place whole chicken on top of vegetables. Cover slow cooker with lid and cook as manufacturer directs on low setting 8 to 10 hours or on high 4-5 hours. Transfer chicken to cutting board. Discard bay leaves. Add noodles to slow-cooker; cover with lid and cook (on low or high) 20 minutes. While noodles cook, remove and discard skin, fat and bones from chicken; shred meat. Skim fat from soup and discard. Return chicken to soup to serve.